You know that “healthy” breakfast that leaves you RAVENOUS by 10:30am? Yes, we’re talking about that yummy cereal. Even the whole-grain one converts into sugar almost immediately in your body, as do the granola bar and the breakfast cookies. These high-carb breakfasts are delicious, but they do not fill you up. Like anything high in carbohydrates, they cause fluctuations in blood sugar that can leave you exhausted and hungry mid-morning, hours before lunch. Too many of us deal with these blood sugar lows by reaching for yet more sugar – grabbing a candy bar from the vending machine (worst case scenario), or even having a piece of fruit – a much better option, but fruit are still high in sugar, which means more of that sugar roller coaster going on in your body. If you’re tired of the sugar roller coaster and the endless cravings, and would like to try something new, we have one word for you: protein. A breakfast high in protein will not just keep you fuller for longer and help you avoid dips in blood sugar levels – it can also help kick start your weight loss, because while a high-carb meal raises your insulin levels, and insulin is a fat storage hormone, a high-protein meal won’t have the same insulin-raising effect. So what can you have for breakfast that’s high in protein and yummy? A cup of thick, creamy Greek yogurt is ideal – even better if you add a handful of nuts, because the combination of the protein in the yogurt and the healthy fat found in nuts is extra satiating. 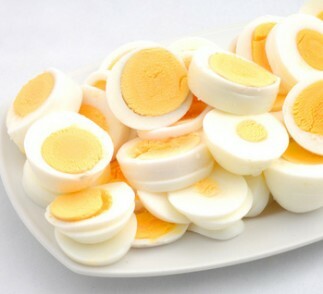 Eggs are another great option for a protein-rich breakfast. These baked egg and bacon muffins can be prepared in advance and quickly reheated in the microwave, providing you with 16 grams of yummy protein per muffin. If you find it difficult to give up classic breakfast foods, try high-protein versions of them. For example, two of these Greek yogurt banana pancakes will provide you with 10 grams of protein and just 200 calories. Replacing the typical high-carb breakfast with a more substantial and filling protein-rich breakfast will leave you satiated, curb cravings, and will likely eliminate the need for a midmorning snack. If you do feel that you need something to tide you over until lunchtime, have more protein – a cup of yogurt, a hardboiled egg or an ounce of cheddar. It’s fine to add a piece of fruit too, but be sure to mitigate the effects of the fructose by adding protein to each of your meals and snacks.